← Perfect Picture Book Friday-Snip Snap! What’s That? Thanks for dropping by my blog with all your sweet compliments. Great! I hope that you like it as much as I do. I love frogs! this sounds like it would be a great read aloud book the kids would love. It is a perfect read aloud, Janet. I hope you get a chance to read it. I sure like that cover!! I would have picked it out too! And those sounds to go along with it! yes, a good read aloud, read along — thanks for sharing this one! Not sure if someone mentioned this but if you google around you can actually hear frog sounds from various species! Lots of fun!! Jug-a-rum is what the bullfrog says (I think!). Kids enjoy this. This is a MUST READ for me!!! I like the cover! Thanks for coming over, Erik! The cover is great…it really hooked me! Looks like a fun book. Off to the library website I go. Ka-blu-urp! I’m not sure I could come up with 10 frog sounds. This book sounds very inventive. I know what you mean, Kirsten. She was very creative! I clicked on the link for your blog and immediately began to smile. You used the word delightful. I agree, this cover is delightful. 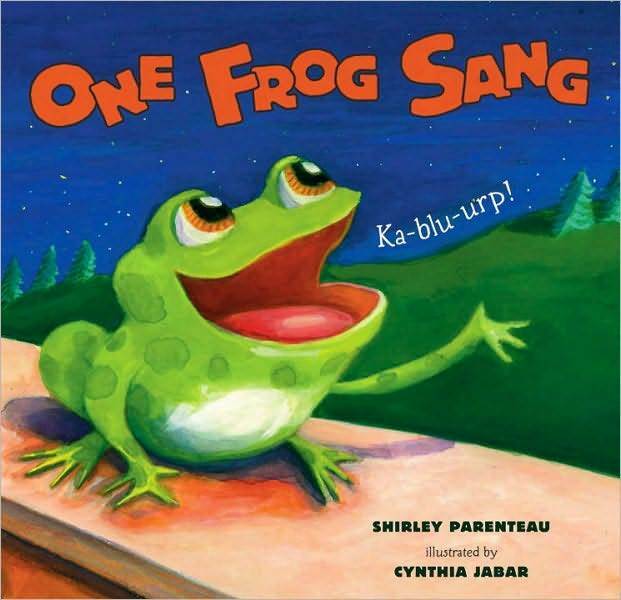 My goodness, just thinking about sharing this book with preschoolers and imagining their giggles from the ten different frog sounds is so exciting. I’m excited about this book, Penny! You’re lucky to be able to fall asleep to frog songs! I know your preschoolers will love this book! Glad you’re excited about it, Pam! There is something inherently charming about frogs…even if they never turn into a prince! Thanks for the recommendation, Penny! I used to live near a “frog pond” and have always had a soft spot for them. I think I will love this book and my kids will, too! I hope they enjoy the book, Laura…I think it’s pretty much guaranteed that they will. This sounds great, Penny! I’ll look for this one to read to my daughter. She will love it! I think all kids would find it fun and ask for rereads! Once again,you’ve picked a delightful book. The cover is very inviting. Love the combination of a symphony of nature’s sounds with counting. Lovely choice, Penny. Thanks, Pat! The cover invited me to take it home! And I’m so glad I did! Sounds abound? Putting it on hold! This sounds delightful, Penny! I love all the onomatopoeia! I’m impressed that the author came up with 10 different frog sounds 🙂 And you’ve made me think of peepers in springtime which has reminded me on this cold, raw, sleet-is-on-the-way day that spring will come 🙂 Thanks! Yes, spring will eventually come with all its delights…in the meantime this book will bring pages of delight to any day! What a fun sounding book for Enzo. On one of my travels, I hear frogs that sounded like champagne bottle popping. Can’t wait to get this one. Champagne bottle popping? That is fun! Hope Enzo loves it! He does look very kissable, Penny and I just love al that onomatopoeia! Me too! Kids really like onomatopoeia. I mean…just saying onomatopoeia is fun! Hop, hop hurray! Sounds like a fun read and the cover frog IS cute enough to smooch! Isn’t he? He has his own special charm. Hope you get to read the book! Cathy is the cleverest! Such a quick wit she has! Thank you for this book and the link to Susanna’s blog. Do you know the poem I mentioned on Laura’s blog? “Frog” by Mary Ann Hoberman? It sounds like a great match. My students love everything about “Frog”! Learn it easily, want to say it over and over, Love doing the “fast” version all together. Great curriculum connection, too. I wasn’t familiar with that poem! But I found it on the Internet and just loved it. Thanks for telling me about it. I love Mary Hoberman anyway and have read everything our library has that she has written! Actually I see a connection between “Frog” and some of your great poems!! I just saw your video at NWR!! So great so meet you in person. Someday I will have a blog going, hopefully soon!! Always look forward to meeting you on Thursdays! My goal is to be a regular as often as I can!! I love Thursdays! I am saving all of my 15 word poems in a folder for inspiration and possible revision into longer works. I love seeing everyone’s “takes” on the photo Laura presents! Speaking of blogs…do you follow David A. Harrison. You should check out this post where J. Patrick Lewis issued a challenge. It is just so much fun! I love how excited you are about this frog book, Penny. Sounds croaktastic! What a charming sunny book and that frog on the front cover does look smoochable. Love your light, enthusiastic and endearing review Penny. Thanks, Diane! Glad you enjoyed my review and hope you enjoy the book.